The high speed mixer combines the hot mixing and cold mixing processes, and the hot mixing materials are automatically cooled into cold mixing to remove residual gases and prevent agglomeration. 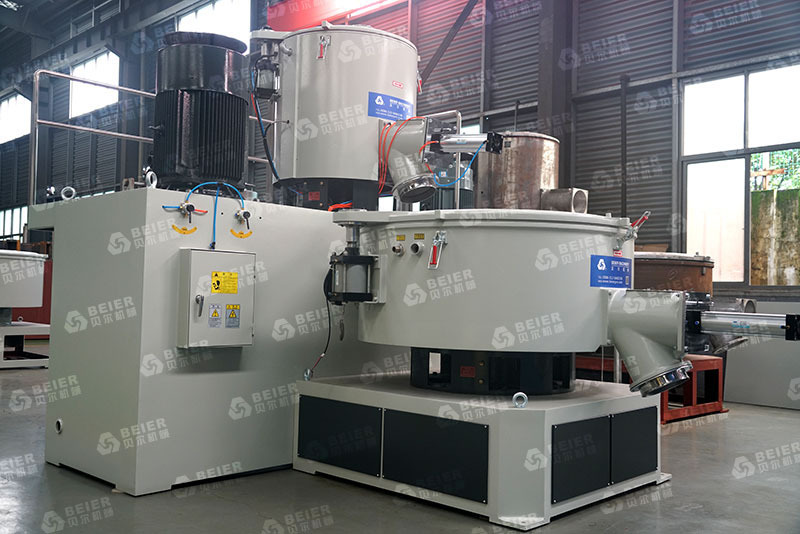 The liquid raw materials with different viscosities are pulverized, dispersed, emulsified and mixed, and the high-speed, high-speed mixing equipment of the high-speed operation of the upper and lower teeth of the dispersing disc is used to rapidly shear, impact, pulverize and disperse the materials at a high speed. The function of mixing, dissolving, dispersing, and refining. The high speed mixer of Beier Machinery series is developed, digested and absorbed by foreign advanced technology. The electrical control adopts imported original parts and is equipped with PLC and the latest computer control. It has high automation program, good mixing effect, and self-friction and electric heating function. At the end of each shift, the tank needs to be cleaned. Please refer to the instructions provided with the instructions for the maintenance of the agitation geared motor. When replacing seals or servicing high speed mixers, first turn off the power and the automatic switch is in the stop position. When the material at the bottom of the tank is discharged, the seal can be repaired or replaced in time according to the discharge degree. When replacing the seal, the stirring paddle should be taken out.